CIMMYT and Bayer’s Crop Science team are looking for practical solutions to future climate-change related challenges in South Asian agriculture. NEW DELHI (CIMMYT) — Rice-wheat rotation is practiced by farmers on over 13 million hectares of farmland in South Asia, providing the primary source of food security in the region. However, climate change is projected to have a huge impact and reduce agricultural production 10 to 50 percent by 2050. Complex and local impacts from climate change and other challenges require solutions to risks that can be readily-adapted. 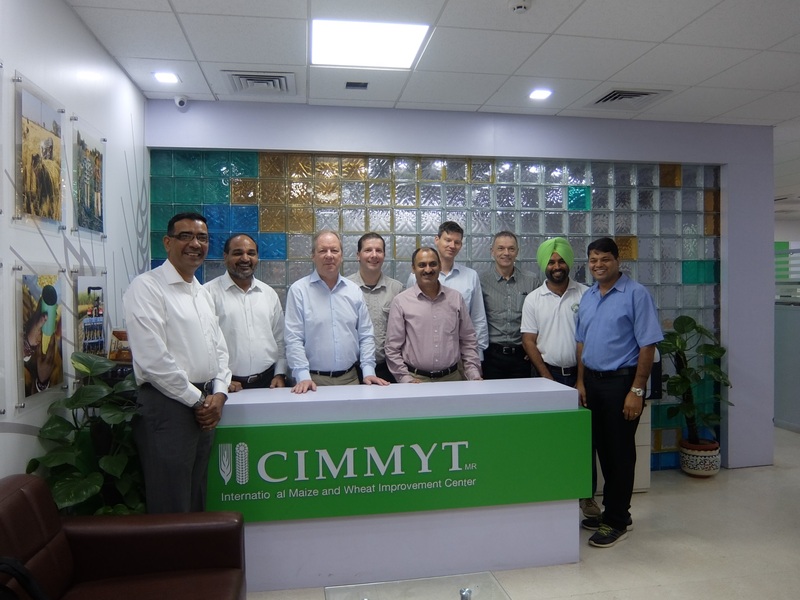 Representatives from Bayer Crop Science recently visited the International Maize and Wheat Improvement Center (CIMMYT) offices in India to discuss the potential for developing jointly managed sustainable approaches and technologies to address such challenges. Sustainable intensification, which involves such conservation agriculture practices as minimal soil disturbance, permanent soil cover and the use of crop rotation to increase profits, protect the environment, maintain and boost yields, is a potential solution that has worked to address the impact of climate change in South Asia. Such practices contribute to improved soil function and quality, which can improve resilience to climate variability. 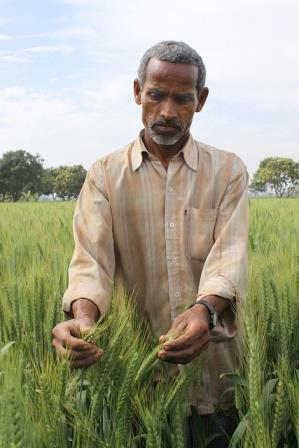 “Systems research with conservation agriculture practices like direct seeded rice, no-till wheat and recycling crop residues have shown tremendous potential to address the challenges of water and labor scarcity, conserve natural resources and lower the environmental footprint of South Asia’s food bowl,” said M.L. Jat, CIMMYT senior cropping systems agronomist and the South Asia coordinator for the CGIAR Research Program on Climate Change, Agriculture and Food Security, collaboratively managed by the CGIAR consortium of international agricultural researchers. During the Bayer meeting, challenges and opportunities were identified for direct seeded rice — which requires less labor and tends to mature faster than transplanted crops — and sustainable intensification programs throughout South Asia, particularly in India. Discussions were based on the success of other CIMMYT-Bayer collaborations across South Asia that aim to address agricultural challenges through sustainable intensification — including direct seeded rice — quantifying mitigation potential of conservation agriculture-based management in rice-wheat rotation and smart farm mechanization to make farm management more efficient and productive. Moving forward, CIMMYT and Bayer will focus on agricultural systems research to ensure even more effective interventions with higher yields, collaborate to develop new sustainable technology and increase uptake throughout the region. Sustainable intensification practices are expected to continue to grow in the region thanks to these and other collaborations, along with the advent of technological advancements and increased adoption. Bayer representatives at the meeting included: Hartmut van Lengerich, head of cereals and fungicides; Juergen Echle, global segment manager of rice herbicides; Christian Zupanc, global segment manager of rice fungicides; Mahesh Girdhar, global crop manager of rice and Rajvir Rathi, vice president of public and government affairs. CIMMYT representatives included: Tek Sapkota, mitigation specialist; Balwinder Singh, crop modeling specialist and Alwin Keil, senior economist. Conservation agriculture practices are climate-smart, helping farmers adapt to climate change while minimizing greenhouse gas emissions, researchers say. The rates of growth of staple crop yields in South Asia are insufficient to meet the projected demands in the region. With 40 percent of the world’s poor living in South Asia, the area composed of eastern India, Bangladesh and Nepal has the largest concentration of impoverished and food insecure people worldwide. Since 2004, conservation agriculture has helped farmers in southern Africa maintain and boost yields, protect the environment and increase profits.